Dolby Vision has the potential to improve consumers’ watching experience by constantly optimizing the way how their TVs deliver HDR pictures. It also gives content producers more control over how their HDR programming appears on TVs. And it’s coming to smart-phones and tablets, too. 4K resolution, or 4K for short, refers to the level where the horizontal resolution of monitor or content reaches 4000 pixels and the vertical resolution reaches 2000 pixels. Dolby Vision is an image quality technology developed by Dolby laboratories in the United States. Dolby Vision improves image quality by increasing brightness and extending dynamic range. It enhances the video signal fidelity, so that the image is vivid and realistic from the perspectives of brightness, color or contrast and so on. By presenting breathtaking brightness, color or contrast effects, Dolby Vision can completely change your watching experience whether in cinema or video devices. Dolby Vision provides a wider color gamut and high dynamic range, and generates images that are 40 times brighter than today’s ultra HD TV signals, offers bright highlights, vibrant colors and deep, dark details that have never been seen on a theater or standard TV screen before. What is more, Dolby Vision can fully display coloring effect with light and shade contrast HDR technology advantage. Being similar to other HDR specification, Dolby Vision is also based on metadata processing. The metadata is dynamic, which means that it does not form a fixed algorithm, but adopts real-time optimization in view of the different scenarios. This metadata carries scene-by-scene instructions that a Dolby Vision-capable display can use to make sure it portrays the content as accurately as possible. Video looks more beautiful and realistic, especially when the frame showing more light and shade levels. Dolby Vision also has strict requirements for display devices quality, requiring a minimum screen contrast 200000:1, peak brightness 1000 nits, color gamut close to Rec 2020 and supports SMPTE ST2084 HDR format. By retaining and reproducing brighter and richer color pixels in video, Dolby Vision improves the visual quality of video. 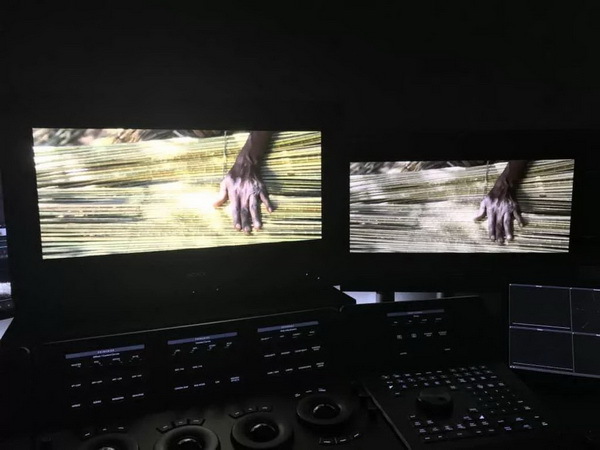 In the production process of Dolby Vision video, high dynamic range monitor PULSAR will be used to complete the toning work, and content management to master production. After the reconstruction of video ecological chain by Dolby Vision technology, the video dynamic technology is greatly improved with the darkest 0.007 nett and the brightest up to 4000 nit. Dolby Vision allows content producers to have either one or two “layers” of data; one carrying just the HDR signal, the other carrying the standard dynamic range (SDR) signal. This single HDR/SDR work-flow approach makes Dolby Vision a convenient tool for content creators and broadcasters to use. 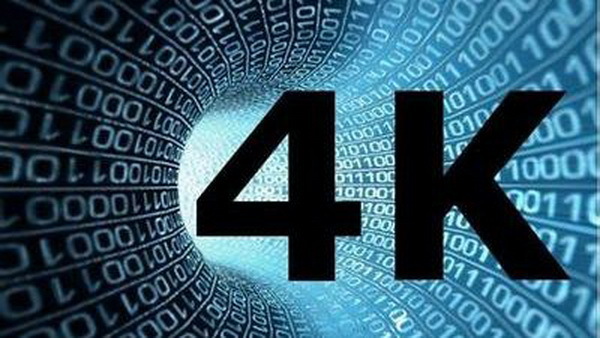 4K is a high-definition display technology, mainly used in the television industry, film industry, mobile phone industry. Various 4K resolutions are available now in the field of digital television and digital photography. Emerging digital film and computer video with ultra high resolution standard match with ultra high definition TV. Common resolution of 4K function TV are 3840 x 2160 or 4096 x 2160 pixel 2 specifications. 4K resolution refers to pixel value of horizontal direction reaches 4096, and it specifically refers to 4096*2160 resolution. According to using range, there are various resolutions based on 4K available, such as Full Aperture 4K 4096*3112, Academy 4K 3656*2664 and UHDTV standard 3840*2160. As the core element of television picture quality technology, it does not just bring a sense of novelty to people, but improves performance of TV essentially compared with 3D, multi-screen interaction and other technologies, so that users can feel the visual feast brought by the best picture quality. The 4K resolution offers more than 8.8 megapixels of cinema-quality, four times as the current top 1080p resolution. UHD is also expensive with 50 megabytes of data per frame, so it requires a top-notch machine for both decoding and editing. With the amazing 4096 x 2160 pixels resolution, viewers will be able to see every detail, every close-up no matter where he sits in the cinema. The film is colorful, the words are clear and sharp, and the sound effect is super real. This feeling is really a kind of unspeakable enjoyment. The answer is no. They can completely change your watching experience whether in cinema or video devices similarly. But they are still two aspects to visual experience. Dolby vision enhances the video signal fidelity, so that the image is vivid and realistic from the perspectives of brightness, color or contrast and so on. 4K with the amazing 4096 x 2160 pixels resolution, viewers will be able to see every detail, every close-up in detailed aspect. You can see that they are certain technology tools focusing on different aspects to improve better watching experience. If you want to watch movies with the best quality picture and uncompressed picture quality from your movie sessions and TV, you may need to invest in a 4K Ultra HD Blu-ray player. Here I would like to recommend 5 best 4K Ultra HD Blu-ray players you can get from the market. Let us have a quick look at the best 4K Blu-ray players available to buy today. Supporting for both major forms of HDR and object-based surround sound, Sony’s UBP-X700 is one of the best Blu-ray player you could buy. The UBP-X700 delivers everything you need to enter the new UHD HDR world. The X700’s keen pricing makes it a high-value overachiever. Advanced surround sound, 4K detail, and vibrant High Dynamic Range images offer a visual experience for the ultimate immersion providing users with the better picture four times the resolution of conventional Blu-ray™ (Full HD), which also is equipped with new 4K Ultra HD Blu-ray™ discs and 4K streaming services. Dolby Vision™ is an HDR solution that creates an immersive, engaging cinematic experience in your home. 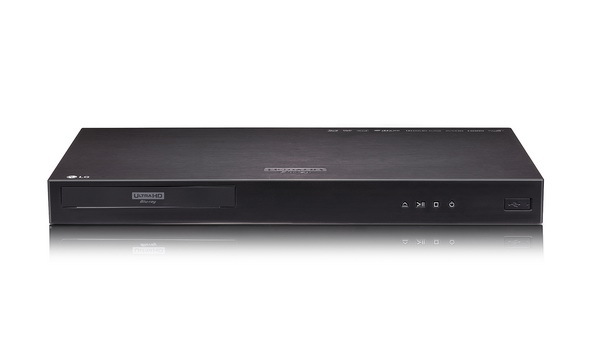 The UBP-X700 features advanced upscaling of everything you watch to 4K resolution. The Philips BDP7502 4K Ultra HD Blu-ray player with HDR support is another ideal choice to realize the full potential of your 4K TV with 4K UHD Performance. With incredibly sharp 4K images with vivid colors and contrast, it made possible thanks to High Dynamic Range 10 support. Dolby Vision transforms your TV experience with dramatic imaging – incredible brightness, contrast, and color that bring entertainment to life before your eyes. With more light-to-dark contrast and colors never before seen on TV, the result is a refined. Lifelike images that will make you forget you’re just looking at a screen. Your Standard Definition and High Definition videos have never looked better. 4K up-scaling processor delivers images that are crystal clear. Movies in standard definition and high definition can now be enjoyed in nearly 4K Ultra HD, ensuring more details and more true-to-life pictures. Pioneer says "the UDP-LX500 has also been engineered to be a superb audio-only player." There’s a direct function for analogue audio playback, which turns off the digital audio and video circuits, and Pioneer’s PQLS (Precision Quartz Lock System) for HDMI connection to compatible Pioneer receivers (SC-LX701, SC-LX801, SC-LX901). The UDP-LX500 is compatible with both SACD and DVD-Audio discs, and is High-Res able. It’s also a 3D Blu-ray compliant. LG UBKC90 4K Ultra HD Blu-ray Player is also another 4K player I would like to recommend for you here. It supports Dolby Vision & HDR10 with true advanced 4K upscaling. 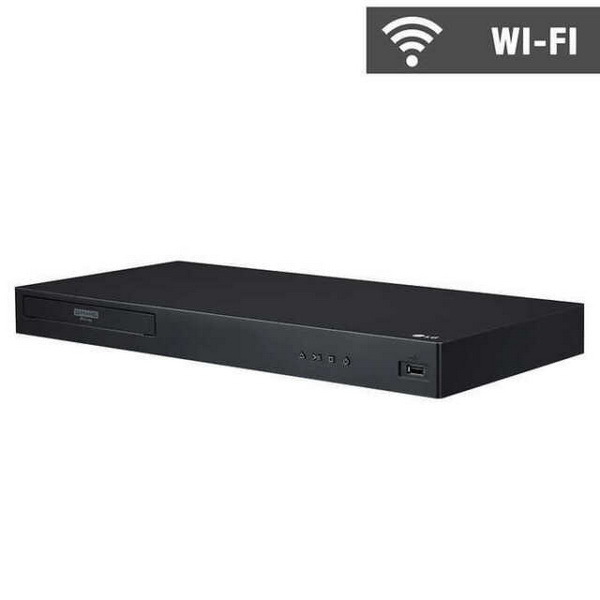 By offering the 4K streaming content, it plays multiple kinds of discs including 4K UHD Blu-ray disc, 3D Blu-ray disc and DVDs with built-In Wi-Fi function. LG Blu-ray player UP970 offers 4K Ultra HD HDR that can unleash your entertainment. This 4K Ultra HD HDR Blu-ray Player is capable of 4K and HDR playback, bringing a whole new level of detail and color to what you watch on the screen. You will get the finest viewing experience possible with this 4K Blu-ray player and an LG TV. LG Blu-ray player UP970 supports the premium HDR and Dolby Vision™ favored by renowned filmmakers from all over the world, showing more realistic and natural Images. Content created for High Dynamic Range or HDR can display an even more breathtaking picture with bolder contrast and more vibrant colors. LG Blu-ray player UP970 is HDR compatible with Dolby Vision™* and HDR10. As a free Blu-ray disc player program, it plays Blu-ray discs for totally free. It’s also downward compatible with DVD discs playback suitable on Windows and Mac system. It could play back all Blu-ray and DVD discs in the market from various movie studios, even they’re just released. It’s not only a free DVD disc player, but also free DVD player to play DVD folder and DVD ISO image file for totally free. It could play videos of up to 1080P in HD MP4, HD AVI, HD MOV, HD TS, etc..
It’s a free 4K video player displaying extraordinary image and audio experience for users. In capable of playing 4K video in MKV, MP4 and TS formats, 1080P videos in HD MP4, HD MKV, HD MOV, etc., 720P videos in MP4, AVI, MKV, and other formats. Leawo Blu-ray Player offers practical bonus features to better movie night. It even supports audios in AAC, AC3, MP3, M4A, etc. in lossless quality. 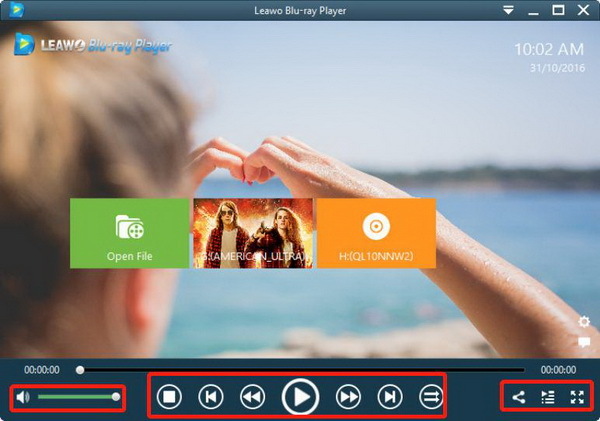 Moreover, Leawo Free Blu-ray Player is an easy-to-use Blu-ray media playback software program. You could even try to customize this free Blu-ray media player software. Step 1. 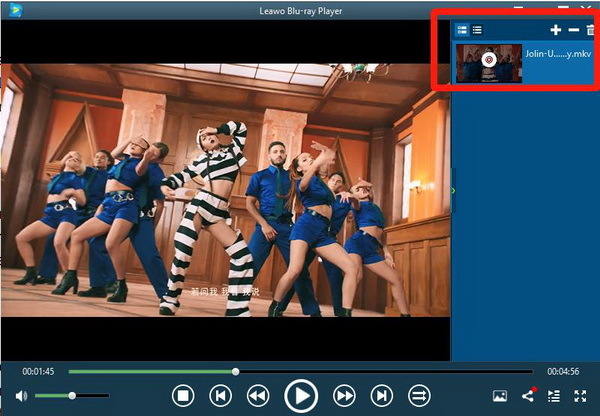 After launching Leawo Blu-ray Player, click the green “Open File” button to browse and load video, audio and ISO image file from your local drive or discs. Step 2. At the bottom of the main interface, you could see multiple playback control buttons to help you control media playback: then you can adjust volume, play video, fast back forward or forward video even share Leawo Free Blu-ray Player on Facebook. Leawo Blu-ray Player supports to deliver quality-lossless video images with resolution of 4K (2160P), together with 4K content and a 4K display, so you could download this Windows Blu-ray player freeware to get Ultra HD movie experience at home with a very easy-to-use Blu-ray media playback software program. By offering comprehensive solutions for you to play back Blu-ray, DVD, ISO files, common video, HD video and audio files on Windows PC smoothly, it is worthwhile to have.